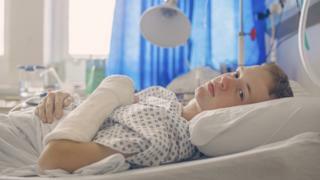 A vulnerable teenage boy told he will never walk again after a bridge fall was trying to escape from bullies, say his family. Joshua Davies, 18, of Pontypridd, Rhondda Cynon Taf, broke his spine in four places in the fall. His family said police had been contacted 15 times about attacks on the teenager, who has Asperger's syndrome. South Wales Police said it has carried out "a thorough investigation" into assault complaints. Joshua's stepfather Michael Morgan, 35, described the moments leading up to the teenager's fall onto the dry riverbed. He said: "Joshua and his friend were walking by the river, when they realised some boys were following them. "Joshua and his pal climbed on to the steel supports of the bridge to get away but the boys started throwing stones at them. "One of the stones hit Joshua on the shoulder and another hit him on his foot - he lost his grip and fell." The family claims the teenager has been bullied for the last five years, targeted because of his disability, which is a form of autism. Mr Morgan said: "Joshua has always had some kind of harassment or bullying in some shape or form, solely due to the fact that Joshua is an easy target. "Because of his Asperger's he does not have the social skills to deal with the situation. "He does not have the understanding that people can be cruel." The family claims Joshua was attacked earlier this summer when he refused to buy alcohol for local youths. Mr Morgan said: "He came out of the local corner shop and one of the boys jumped on his back, and started hitting him on the back of his head. "That was the only time he defended himself and he was arrested and charged, which made him scared to defend himself again." Mr Morgan said his stepson has been to the police for help more than 15 times but was not taken seriously. He said: "We believe this could have been prevented. Joshua reported having issues with these boys before, but his problems were brushed under the carpet because they thought he was messing around." His mother Cheryl Morgan, 44, a full-time carer for her other son Michael who also has autism, said: "Joshua is not a fighter - he's a very gentle young man who now faces life in a wheelchair. "I think this could have been prevented if the police had listened to him." South Wales Police said it dealt with three allegations of assault between April 2011 and June 2014. Det Insp David Peart said: "On each occasion, a thorough investigation took place and appropriate action was taken. There is no evidence to suggest that the incident which took place on August 17 is connected." "Each time, the circumstances surrounding these allegations were fully investigated and appropriate actions were taken in consultation and in full agreement with the complainants. "In two instances, it was agreed between all parties that any further action would be inappropriate. "There is currently no evidence which links this incident to anything which occurred previously." Doctors at University Hospital of Wales in Cardiff have carried out three operations on Joshua, who will not be able to sit up for six weeks. Three youths - two aged 15 and one aged 16 - remain on police bail while inquiries are continuing.